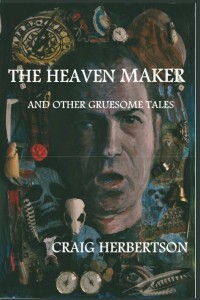 THE HEAVEN MAKER, AND OTHER GRUESOME TALES by Craig Herbertson, Parallel Universe Publications, pb, £11.99. I hadn’t heard of Craig Herbertson before I picked this up, and this collection of twenty dark stories was a pleasant surprise. The title story is probably the highlight: a grand epic told in a few short chapters about a man trying to rescue his wife from Hell. Reminiscent of Machen’s ‘Great God Pan’ in tone. Several stories feature Mulholland the occultist, a splendid character who was great fun to spend time with. The best of those was ‘Liebniz’s Last Puzzle’, in which he is one of three academics trying to solve a fiendish puzzle, though none of them are clever enough to think it might not be a good idea. ‘The Anningly Sundial’ was another highlight, riffing on one of M. R. James’s best known stories. Several stories are based in or around high schools – my favourite of those is ‘New Teacher’. You may have heard a classroom so rowdy it sounds like someone is being murdered. Another group of stories is very much in the Pan Horror vein. Little nasty revenge tales or outlandish and implausibly horrific situations described with wicked glee. Look out for ‘A Game of Billiards and Soup’. And there is poetry, a two page joke about Hibernian Football Club and the holy grail, lots of references to malt whisky, and a lovely little Christmas tale to finish off. Overall, a satisfying read. A well written mix of the literary, the trashy and the darkly humorous. A fine addition to any horror lover’s library.